Brinjal is my most favourite vegetable.But i am not able to make brinjal recipes often in my kitchen because Sendhil & Raksha are not fond of it.So i used to cook some interesting kathirikai recipes whenever my in-laws visit my place. This time, i tried Rasavangi recipe learning from my MIL.Usually we make Rasavangi using Ash gourd/Poosanikkai.But i tried with the freshly bought eggplant from Salem.It was too good & i loved it a lot.I am sure brinjal lovers would love this gravy for rice.Do try it ! 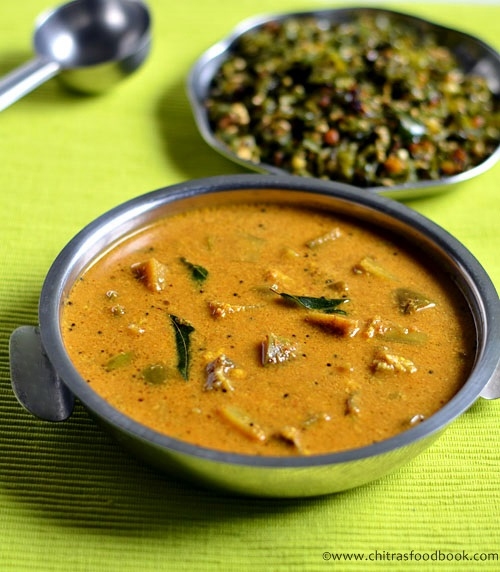 Brinjal Rasavangi Recipe / Kathirikai Rasavangi Recipe for rice - Yummy brinjal recipe ! This quantity serves 4-5 persons. Please reduce to half for 2 persons. Wash and soak chana dal in required water for 15 minutes.In the mean time,wash and chop the brinjal into small cubes & keep it immersed in water. In a pan,heat a tsp of oil and roast the coriander seeds,urad dal & red chillies adding hing.Add grated coconut,roast it lightly and grind them to a smooth paste adding little water.Set aside. In a wide bowl,take the soaked chana dal.Add enough water & cover cook for sometime around 10 minutes.Add tamarind extract, chopped brinjal pieces and cook till it turns soft but it should retain its shape. While cooking,add turmeric powder & salt. ( U can add 1/2 tsp of sambar powder if u want more flavour) . Now add the ground paste,a pinch of jaggery and little water.Boil for sometime and switch off the flame.Temper at the end. Garnish with coriander leaves. Mix with plain rice adding few drops of ghee! U can replace brinjal with ash gourd. Replace chana dal with toor dal. 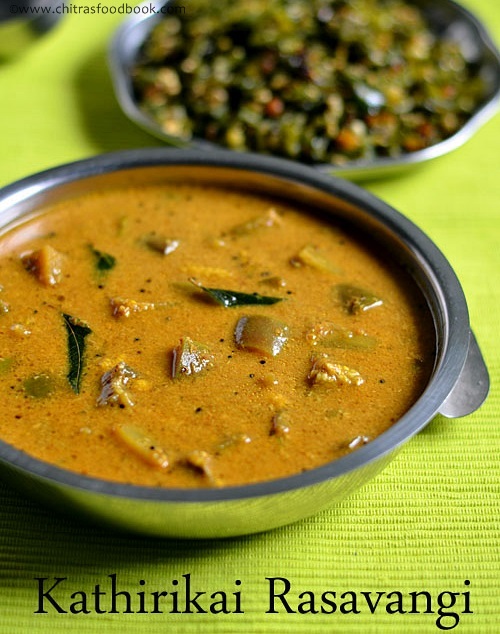 Sambar powder is optional as it is not aaded in authentic rasvangi.Instead u can add some powdered roasted pepper corns. Enjoy brinjal rasavangi with plain rice adding few drops of ghee ! It tastes yum !! Yummy feel like having some! i too love brinjal n keep trying new recipes of it... il try this sometime..
Looks delicious and nice clicks too..
Heard of rasavangi ,but never tried it.My husband likes brinjal so much ,interested in trying it sometime. I love rasavangi and they make it very well in my MIL`s home. Lovely clicks.